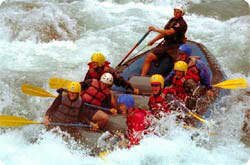 Himalaya Journey Treks & Expedition: Rafting in Nepal,Nepal River Rafting. Rafting in Nepal is one of the best places in the world . Nepal is 2nd largest country for water resourse . Nepal has 1310 River among them more than 16 river are used for rafting adventures in Nepal. Numerous fine rivers offer excellent opportunities for rafting, canoeing and simply immersing oneself in the magnificent landscape. Nepal's thundering waters, coming from the glaciers of the mighty Himalayan, provide unmatched thrills. No other country has such a choice of trips on wild rivers with warm water, a subtropical climate and white sand beaches. Truly, this could be the highlight of your lifetime. Nepal has earned a reputation as one of the best destinations in the world for white water rafting. Nepal's thundering waters, coming from the glaciers of the mighty Himalayas, provide unmatched thrills for rafting and immersing oneself in the landscape.Rivers are graded on a scale of one to six, with one being a swimming pool and six a one-way ticket to your maker. White water rafting is negotiating river rapids and obstacles in an inflatable rubber boat with a team of up to eight people and a river guide. Rivers are graded from easy to near-impossible according to their size, the intensity of their rapids and the difficulties that may affect rescue attempts.Since River has been for Rafting,Himalaya Journey Treks and expedition has arrange numerious Rafting adventure seekers in different rivers of Nepal.